The International Olympic Committee will reportedly consider South Korea's request to send a unified hockey team to the Winter Olympics. As delegates from North Korea and South Korea prepare to meet Monday, an Olympic committee is reportedly mulling whether to allow a single Korean women's ice hockey team to compete. 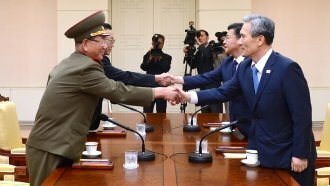 So far, only North Korea's pairs figure-skating team has qualified to participate in the February games. Monday's meeting between the North and South will reportedly include talks of the North's art troupe heading to the Olympics. And later in the week, the International Olympic Committee will discuss the South's proposal of a unified Korean hockey team. North and South Korean athletes have never jointly competed in the Olympics; the closest they've come is in 2000, 2004 and 2006, when delegations marched together during the opening ceremony. Each time, they carried the flag of a unified Korea. Even with the IOC's support, questions about how to fill the team roster, select coaches and choose training locations could derail the idea. That being said, the New York Times points out a single Korean team playing against Japan — the peninsula's former colonizer — could have deep symbolic meaning for Koreans on both sides of the demilitarized zone. The IOC is scheduled to meet with both Korean Olympic committees, the international hockey federation and the games' organizing committee Jan. 20.